Mummy Cave is a large overhang or rock-shelter situated in the valley of the North Fork of the Shoshone River between Cody and Yellowstone National Park in northwest Wyoming. The site was named after a Native American burial preserved by the dry conditions in the shelter. Mummy Cave was excavated by the Buffalo Bill Historical Center from 1963 to 1966 with funding provided by the National Geographic Society. The excavations of 1963–65 were directed by Robert Edgar, a very knowledgeable Cody amateur archaeologist. The final year of work was directed by Wilfred Husted of the Smithsonian Institution, River Basin Surveys. Waldo R. Wedel (1908–1996), archaeologist emeritus in the Department of Anthropology of the Smithsonian Institution, provided general project direction throughout its duration. Mummy Cave is notable for its depth of cultural deposits and uncomplicated stratigraphy. Thirty-eight distinct occupation levels were found within 28 vertical feet of deposits. In most cases, each individual cultural layer was separated from its neighbors by sterile deposits. The 38 occupation layers represent occupation of the shelter from the Paleoindian period around 10,000 years ago to the Late Prehistoric period about 1600 A.D. This succession of cultural strata, many dated by radiocarbon, provides a firm chronological and cultural base for the middle Rocky Mountain area and beyond. The Paleoindian deposits in Mummy Cave were instrumental in the determination that there are major differences between the Paleoindian of the Plains, including Clovis; Goshen and Folsom; and contemporary occupation of the foothills, mountains, and intermountain basins and valleys of the Rocky Mountains. While the Paleoindian sites on the high western Plains suggest an economy emphasizing a hunting economy, sites from the foothills, mountains, and intermountain valleys are more indicative of a hunting and gathering way of life, much like that of the Shoshone and related peoples of the historic period. Another remarkable feature of Mummy Cave is the preservation of artifacts made of perishable materials. Arrows with fletching, cordage of plant fiber, netting, feathers, and coiled basketry are among the many items some 1,200 years old recovered from one of the upper levels of the site. Although fewer in number and variety, items including basketry, cordage and netting, wood digging sticks, and bone pipes and beads were recovered from levels dating from 2,000 to 5,000 years ago. These items greatly expand our knowledge of prehistoric Native American life in the middle Rocky Mountains and surrounding areas. The findings from Mummy Cave have far-reaching import for the explanation of western American prehistory. The prevailing hypothesis on the origin of the Utaztekan-speaking peoples of the west, including the Wyoming Shoshone, proposes the southern Great Basin as the homeland for this widespread language family. However, the evidence from Mummy Cave supported by data from a broad area of the western United States suggests that the middle and northern Rocky Mountains, not the Great Basin, is the base from which the Utaztekan-speaking peoples spread to occupy the high western Plains and Great Basin some 5,000 years ago. Supporting the idea of the Rocky Mountains as the Utaztekan homeland, the perishable artifact inventory along with the chipped stone artifacts provided the evidence to identify the Native American burial and associated cultural layer as Shoshone or a closely related people. The presence of similar and identical artifacts in preceding occupation levels demonstrates cultural continuity during the Late Holocene period or the last 5,000 radiocarbon years. Comparison with material from numerous other archaeological sites in Wyoming and elsewhere in the West suggests that this cultural continuity existed across the area occupied by Utaztekan-speakers in the historic period. 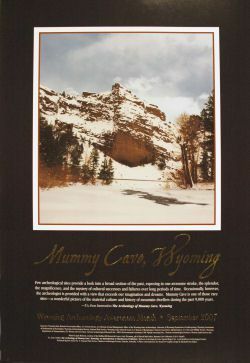 Mummy Cave has added greatly to our knowledge of prehistoric Wyoming and particularly the middle Rocky Mountain region. Many artifacts made of perishable materials have greatly expanded the inventory of implements utilized by the prehistoric inhabitants of the region. The artifacts and data from the excavations permit the challenging of long-held hypotheses of ethnic origins and subsequent population movements. The large collection of artifacts and data from the Mummy Cave excavations will continue to provide a basis for the interpretation of western American prehistory as the archaeological discipline grows and new analytical and interpretive methods and techniques are developed.